Russian World Forums • View topic - What Gives US the Right to Set up Military Bases in Syria? What Gives US the Right to Set up Military Bases in Syria? Post subject: What Gives US the Right to Set up Military Bases in Syria? to Set up Military Bases in Syria? Just when you thought our Syria policy could not get any worse, last week it did. The US military twice attacked Syrian government forces from a military base it illegally occupies inside Syria. According to the Pentagon, the attacks on Syrian government-backed forces were “defensive” because the Syrian fighters were approaching a US self-declared “de-confliction” zone inside Syria. The Syrian forces were pursuing ISIS in the area, but the US attacked anyway. 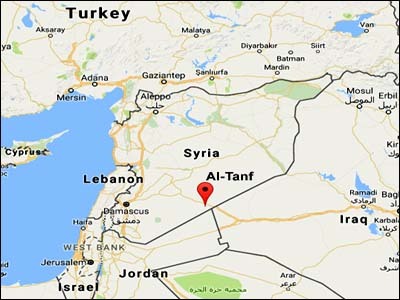 The US is training yet another rebel group fighting from that base, located near the border of Iraq at al-Tanf, and it claims that Syrian government forces pose a threat to the US military presence there. But the Pentagon has forgotten one thing: it has no authority to be in Syria in the first place! Neither the US Congress nor the UN Security Council has authorized a US military presence inside Syria. So what gives the Trump Administration the right to set up military bases on foreign soil without the permission of that government? Why are we violating the sovereignty of Syria and attacking its military as they are fighting ISIS? 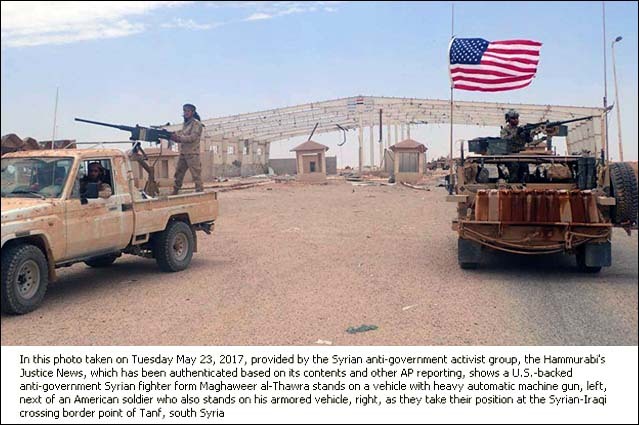 Why does Washington claim that its primary mission in Syria is to defeat ISIS while taking military actions that benefit ISIS? The Pentagon issued a statement saying its presence in Syria is necessary because the Syrian government is not strong enough to defeat ISIS on its own. But the “de-escalation zones” agreed upon by the Syrians, Russians, Iranians, and Turks have led to a reduction in fighting and a possible end to the six-year war. Even if true that the Syrian military is weakened, its weakness is due to six years of US-sponsored rebels fighting to overthrow it! What is this really all about? Why does the US military occupy this base inside Syria? It’s partly about preventing the Syrians and Iraqis from working together to fight ISIS, but I think it’s mostly about Iran. If the Syrians and Iraqis join up to fight ISIS with the help of Iranian-allied Shia militia, the US believes it will strengthen Iran’s hand in the region. President Trump has recently returned from a trip to Saudi Arabia where he swore he would not allow that to happen. But is this policy really in our interest, or are we just doing the bidding of our Middle East “allies,” who seem desperate for war with Iran? Saudi Arabia exports its radical form of Islam worldwide, including recently into moderate Asian Muslim countries like Indonesia. Iran does not. That is not to say that Iran is perfect, but does it make any sense to jump into the Sunni/Shia conflict on either side? The Syrians, along with their Russian and Iranian allies, are defeating ISIS and al-Qaeda. As candidate Trump said, what’s so bad about that? We were told that if the Syrian government was allowed to liberate Aleppo from al-Qaeda, Assad would kill thousands who were trapped there. But the opposite has happened: life is returning to normal in Aleppo. The Christian minority there celebrated Easter for the first time in several years. They are rebuilding. Can’t we finally just leave the Syrians alone?